The CP6 Launch Event, which took place in Liverpool on 14 March and which was sponsored by Mecx Group and PPS Rail, had many things going for it, starting with networking in the best-possible setting. The 200+ attendees from major players in the rail industries and from SMEs were treated to an evening of excellent food, insightful speeches, baffling magic tricks and fruitful interactions with industry colleagues. The opening speech was given by Chris Mariner, CEO of Mecx Group who were sponsoring the event. He started off by reflecting on Control Period 5, highlighting that at launch events in 2014 the UK economic, political and social landscape was a very different one – Brexit hadn’t been invented yet. “I grew up in Northern Ireland, northwest Ireland, which is […] a very pragmatic place and one of my favourite sayings, roughly translated from the Gaelic dialect, is this: ‘one person’s bad luck is another person’s good luck’. And in a way that is sort of true with the Carillion situation. As unfortunate and tragic as it turned out to be for many individuals, subcontractors, suppliers, clients and friends, two positives, in my opinion, have emerged with clear lessons to be learned as we approach Control Period 6. “Firstly, more than ever before, I think there is finally a genuine acknowledgement that the cheapest price is not always, if hardly ever, the best price. I think most punters would agree that a significant contribution to the Carillion failure is derived from a flawed strategy to chase sales at the expense of profit. I strongly believe that Network Rail and other infrastructure clients, but Network Rail in terms of CP6, have seen the light in this respect. No one here is in business to break event. Profit oils the wheels. However, Brexit and the Carillion failure had also created problems. Some of the largest UK contractors had struggled to secure appropriate funding deals because of the uncertainty caused by those two events. “Looking at the map, and meandering through the ages of rail, we see names that are familiar to us today. The original Liverpool terminus at Crown Street was replaced by the magnificent Liverpool Lime Street, six years after the opening of the railway. Rapidly moving to 2018 my team has worked with industry partners to re-signal Lime Street, using current technology, replacing the 70-year-old interlocking. “Wavertree Lane was next, which reminded me of the major re-signalling project between Weaver and Wavertree, which was completed last year using the most recent high-performance network-based signalling equipment. Trains, moving to the east, then passed through Huyten and Roby, an area my team has worked with Network Rail to re-signal in 2014. “At the east end of the line, Stephenson’s original bridge still stands, situated next to the magnificent and iconic Ordsall Chord bridge. Another major infrastructure project that was delivered by the UK industry in CP5. “The Liverpool and Manchester wasn’t the only ground-breaking northwestern achievement. When the Liverpool Overhead Line was opened in 1893 it boasted a range of world firsts, including electrical multiple units. Automatic signalling […] and electric colour lighting. So many of those technologies became the norm for railways around the world and were developed over the decades until they became the technologies of railways today. Rob Morris then took a look back over CP5 and invited the industry to celebrate its successes but also learn from failures, such as the Waterloo incident that occurred in August 2017. He highlighted the key role technology had played in CP5, allowing the introduction of ETCS and automatic train operation. This technology, he said, was also coupled to new threats. Cybersecurity, for example. For CP6, he believed we would see the mix between large and smaller projects change with far more smaller projects being carried out. He spoke highly of Network Rail Chief Executive Andrew Haines and agreed with his mantra that “first and foremost Network Rail is a service company for the country”. He applauded Haines’ approach of canvassing opinion from a broad church and his desire to improve decision-making. The focus was now rightly on the end-user, Morris said. “What is also clear is that the concept of the digital railway underpins much of the aspiration for industry change in the current Control Periods. We were thrilled to be able to work together with Network Rail to deliver ETCS and automatic train operation for Thameslink and to provide much of the technology that enables traffic management to be in use today. 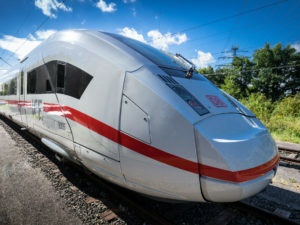 By moving intelligence from the trackside to the train the industry will be able to unlock capacity at the same time as reducing the need for disruptive train and trackside access. “I believe that the opportunities for digital technology extend far beyond the adoption of train control and traffic management solutions as we will all have the opportunity to share data from all of our systems to create a true big and smart data system. His concluding remarks, looking towards the future, also reflected back on 1830. “The start CP6 brings with it the beginning of a new world for the UK rail network. Perhaps even more exciting than the transformational times of 1830. And surely safer. The current incarnation of the digital railway is only a small part of what is possible if we work together and with other industries to create the public transport system of the future. “Concepts such as ‘mobility as a service’ may seem light-years away and certainly need to change society’s view of the importance of, for example, car ownership if we are to adopt such an approach; if we are to create a sustainable transport ecosystem, then we need to look at how to exploit synergies between the different transport modes, not continue to operate in our silos. Following these speeches, attendees were able to network and learn from each other, discussing what they had learned and what their thoughts on CP6 were. After this initial evening Millian Events will next be hosting a rail exhibition – the Millian Runcorn Exhibition (Runcorn, 16 May 2019). This event too is sponsored by Mecx Group with Railway-News as the official media partner. For details about subsequent Millian Events exhibitions, click here.